The Fuji/Rockwell Commander 700 was a joint Japanese-American development between Fuji Heavy Industries and Rockwell International. When Rockwell sold off the general aviation division the agreement was terminated. 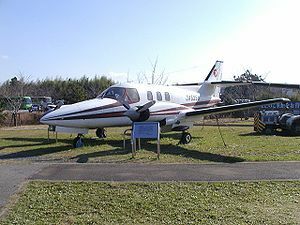 Design of the Commander 700 started in Japan in 1971 with the designation FA-300, in 1974 Fuji signed a collaboration with Rockwell International to design and develop the aircraft as a joint venture. The aircraft was designated the Commander 700 for the North American market. The Commander 700 is a low-wing cantilever monoplane with a conventional tail unit and a retractable tricycle landing gear. The aircraft was powered by two wing mounted Avco Lycoming turbocharged piston engines. The fuselage was designed to be pressurized with accommodation for two crew and four passengers. The prototype first flew in Japan on 13 November 1975 and the second Rockwell assembled aircraft on 25 February 1976. A parallel development was the Commander 710 with more powerful engines which first flew on 22 December 1976. In 1979 Rockwell International sold its General Aviation Division to Gulfstream American and the agreement with Fuji was terminated. Fuji then acquired the worldwide manufacturing and marketing rights for the aircraft. Commander 700 Powered by two 340hp (254kW) Avco Lycoming TIO-540-R2AD engines. Commander 710 Powered by two 450hp (335kW) Avco Lycoming TIO-540 engines. Fuji/Rockwell Commander 700 Pictures and Fuji/Rockwell Commander 700 for Sale.